Los Trios Ringbarkus were a fabulous stand up comedy duo from Melbourne. Neill Gladwin and Steve Kearney formed Los Trios Ringbarkus in 1979 at Rusden State College. Their crumpled suits and awkward, stilted delivery style gave them a unique act on the international live comedy circuit. Their brand of comedy theatre saw them on the world stage, working in theatre, film and TV. They were the first Australians to win the coveted Perrier Award at the Edinburgh Festival in 1983, and toured the world for a decade. Neill Gladwin was responsible for the hilarious closing ceremony of the Sydney Olympics. He was also the director of the ceremony that ended the Paralympics. 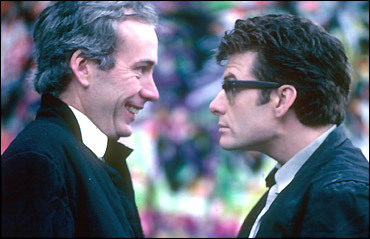 He directed Lano and Woodley when they won the Perrier in Edinburgh in 1994.